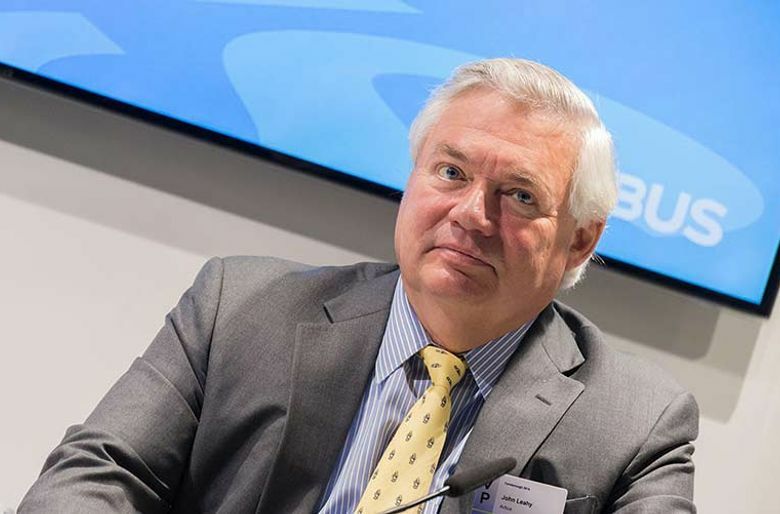 As Airbus super-salesman John Leahy retires from the jet world after more than three decades, he talks about how the European jet maker came from nowhere to achieve parity with Boeing, and how he helped shape and define airliners built by both industry giants. John Leahy, the legendary jet salesman who helped European jet maker Airbus come from nowhere to achieve parity with giant Boeing, is finally retiring. Leahy was more than a sales chief. A demanding and driven leader, he helped shape and define Airbus’ aircraft lineup, and indirectly even Boeing’s lineup of jets. Education: Studied communications and philosophy at Fordham. Learned to fly while earning his MBA at Syracuse. Career: Hired in 1977 by Piper Aircraft to sell its small general-aviation airplanes. Joined Airbus in 1985, promoted to head of North American sales. Appointed head of Airbus worldwide sales in 1994. Recognition: In March 2012, Leahy was named an Officer of the Légion d’Honneur, France’s top civilian award. He was “the guy we all liked to hate at Boeing … but he was very effective,” said Toby Bright, head of sales at Boeing in the early 2000s. In an interview on his way out, Leahy set aside his barbs and recalled some of the turning points and setbacks in the rise of Airbus. His creative and aggressive sales tactics first made their mark in 1986 when he offered Northwest Airlines, essentially an all-Boeing airline, an irresistible “buy small, think big” deal on A320 jets. Yet after Boeing led Airbus by a wide margin in sales for most of last year, Leahy in a last hurrah landed massive sales during 2017’s final quarter to beat his rival one last time in the annual sales race. At 67, overweight and with a history of heart issues, New York-born Leahy is giving up a life of constant airplane travel and jet lag. After a short transition period with his successor, former Rolls-Royce executive Eric Schulz, 54, Leahy says he’ll return to live in the U.S., determined to take it easy, eat right and get healthy. When Airbus hired Leahy as sales chief for North America in 1985, its market share was just 13 percent. He was promoted to head all sales in 1994 and moved to Toulouse, where a year later he confidently told the incredulous Airbus board that his target was to win half the market. In just nine years he got there, creating today’s roughly 50:50 jet duopoly. His team has sold more jets than Boeing in all but four of the last 20 years. After the Boeing downturn following the 9/11 attacks in 2001, Airbus also delivered more jets than Boeing for nine straight years. And though Boeing has now been the top jet producer for the past six years in a row, Leahy confidently predicts that by 2020 Airbus will ramp up its A350 and A320 assembly lines enough to regain the title of world’s No. 1 jet maker. Leahy’s understanding of the market helped shape the jets he was pitching. He put together the launch case for the A380 superjumbo jet with 500-plus seats. And when the initial model of the A330 lacked sufficient range, he argued internally for a longer-range version, a shift that helped propel the jet’s sales past Boeing’s 767. His biggest miss was the four-engine A340, a poor seller that is now defunct. Airbus stuck to the idea of a four-engine plane for long-haul flights, allowing Boeing to succeed with the more fuel-efficient twin-engine 777. To get level with Boeing, in the early days Leahy had to be bold. As Airbus encroached on its turf, Boeing fought back hard. In 1996, as American Airlines sought to renew its fleet, the carrier signed an exclusivity deal with Boeing, buying 103 airplanes with options for 527 more over 20 years — and committing to buy only Boeing jets for that period. Delta made a similar 20-year deal the following year, and then Continental too. When Boeing merged with McDonnell Douglas in 1997, the European Union insisted as a condition of approving the merger that the three exclusivity deals be dropped. But Leahy says the agreements were still honored under the table for many years. It wasn’t until 2011 that American bought another Airbus jet, when Leahy offered the A320neo, an update to the single-aisle jet featuring new fuel-efficient engines. It was a shock that caused Boeing to reverse course. Boeing had been toying with the concept of an all-new 737 replacement, which would have taken years to develop. Instead, it immediately scrapped that idea and rushed to offer a re-engined 737, which became the MAX. “I’m surprised Boeing didn’t see that earlier and start working on the MAX right away as soon as we launched the neo,” Leahy said. Former Boeing exec Bright, now chief executive at airplane lessor Jackson Square Aviation, believes Leahy’s imprint on Airbus will endure. “He’s built a scrappy team. They came from behind. They still have this underdog fight to them,” Bright said. Brash as Leahy is, in his exit interview he was gentle. He said that, on occasion over the years, he got along fine in private with top Boeing executives such as Jim McNerney and Ray Conner. Leahy has sold his mansion in Toulouse, and after 24 years there he will retire to the U.S., where he has homes in Florida and in the Washington, D.C., area.